The story of Roald Dahl’s childhood in his own words. Each of the things he writes about are not earth-shattering, but they did make a great impression on him, so much so that he could remember them sixty years later. I read quite a few of Roald Dahl’s books when I was a child (my favourite was The Twits) so when I heard about this semi-autobiographical book about his childhood I thought it would be an interesting read. And that it was! Born in Cardiff in 1916 to Norwegian parents, Dahl was a part of a large family and it was fun to see what kind of scrapes he got into with his siblings and at school. It wasn’t just interesting to see what Dahl’s life was like but realising that his childhood was probably very similar to my grandparent’s childhood. One thing about Boy that stood out was how it really highlighted how the past is indeed a foreign country. Kids tonsils were removed without any form of anaesthetic, headteacher’s beat children with a cane and when motor vehicles came to be more common place, it was perfectly natural to start driving after a thirty-minute lesson. The way Dahl talks about these events is almost blasé, though he does state how times were different then, in the early 1900’s, and how these things wouldn’t be accepted today. Boy: Tales of Childhood is a quick read and I think it’s a great book as it’s a little snapshot into the past as you follow Dahl’s school life until he’s 20, spanning the years 1922 – 1936. 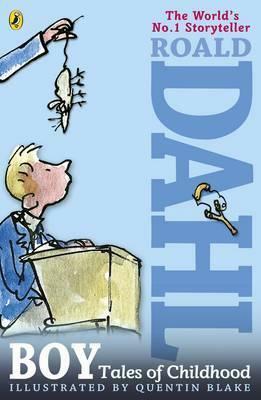 The writing isn’t fancy, but these little incidents in Dahl’s are told in such a way that they are charming and a great way to introduce non-fiction to children. The pages are sprinkled with photographs of Dahl’s family and illustrations from Dahl’s long-time collaborator Quentin Blake which is fun, and you get a little insight into how Dahl got the inspiration for probably his most well-known book – Charlie and the Chocolate Factory.